I wanted to post this outfit on Small business Saturday but my husband was out of town and this mama had her day packed so here we are on Monday! As a mom and entrepreneur I know how much the support of others can make your day. 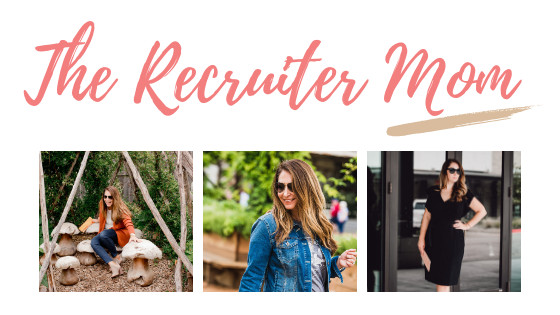 This weekend a friend shared with me a text from her friend that said thank you so much for adding me to The Recruiter Mom Facebook Group I’m loving everything, I literally cried. When I started this I had hoped that I could make a difference in the lives of busy women, helping you all find things for yourself, family and home. Every day I get messages or comments back that you loved something or an idea helped and it has brought me the greatest joy. 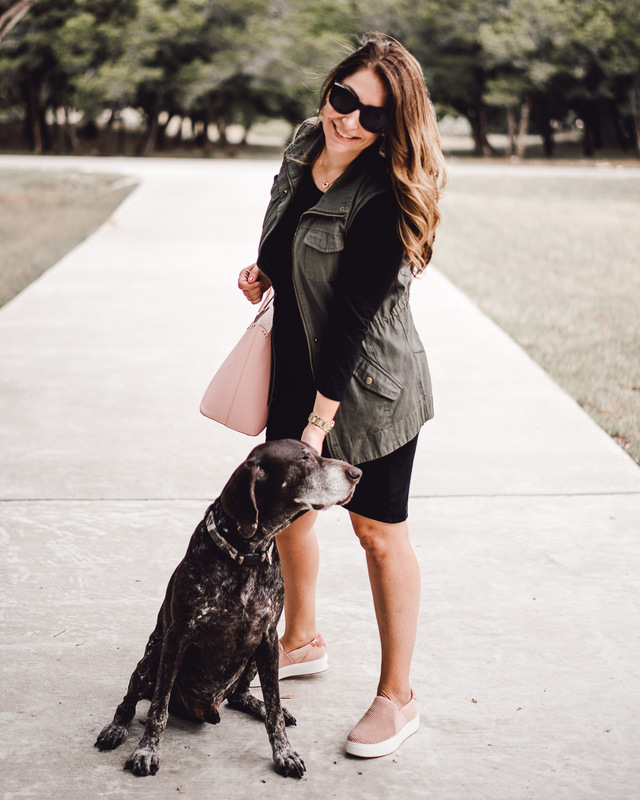 So today I wanted to highlight a top from The Polkadot Alley, a boutique founded and built by another mama Ashley who also happens to be my sorority sister from Texas Tech! Ashley does an amazing job on The Polkadot Alley Facebook group of showing new items that have come in and doing exciting flash sales. A bit ago it was in one of her live videos that I saw this stretchy lightweight tunic and thought well that looks amazing plus it’s only $26! Ashley was wearing a large and was oversized on her but still looked cute. I ended up grabbing the medium because I felt like it would be the correct size and although I wanted some room I didn’t want super big. When I got it in I fell in LOVE, it’s lightweight but soft, oversized but stretchy basically it’s the perfect tunic. The best part is it comes in 11 colors, I’m in the dark olive but just ordered the mustard as well. I’m thinking how perfect with some leggings cooking on Thanksgiving morning! Today though I paired it with my Old Navy Rockstar Jegging that have quickly become one of my favorite pairs of “jeans” with the stretchy wide waistband and slimming feel. I feel that these run true to size and I’m in a 10 Short. Right now you can use your Old Navy Super Cash or code HURRY for 30% off your order making these jeans $21! If you have been hanging around the Facebook group you are fully aware of my recent obsession with the new Kendra Scott Mica stone line. I have been on the hunt to see the Dax and Dunn styles of this gorgeous stone and let me tell you they do not disappoint! I am wearing the smaller of the styles (Dax) in the Sage color. Once I tried them on I realized that I do want the bigger size and have exchanged them for the Dunn style. This stone is gorgeous in person and you can slightly see through it making them really stand out when you are wearing them. When I tell you I’m obsessed don’t be surprised if most of my Christmas list reads.. Kalani Gold Pendant necklace in Sable Mica, Merida Gold Cuff in Berry and on and on! Can I just say WOW, Way to Go and Thank you! Turning a passion into a business is not easy, I have been googling and YouTubing my way through this whole blogging adventure but it always lifts my heart when I look around at all these amazing businesses founded and run by mamas just working their passion too. Happy Mama Business Monday! If you want in on more of my fashion, kid ideas and home organization join my crew in our closed Facebook Group that is where I post most of my deals. Also your love and comments on Instagram help me get found by other awesome women.